Here’s a shocker: Webb City will be playing football over Thanksgiving weekend again. The Cardinals (14-0) will face Cape Girardeau Central (12-2) for the Class 4 state championship on Saturday at 11:00 a.m. at the Edward Jones Dome in St. Louis. Webb City, winners of six of the last eight Class 4 state crowns, will be eyeing its fifth-straight state championship and 13th title overall. Since winning its first state championship in 1989, Webb City has been a model of consistency over the past quarter century. Since head coach Jerry Kill took over the program prior to the 1988 season, the Cardinals have posted a gaudy 319-32 record, a ridiculous .909 winning percentage. The win totals include 10 undefeated seasons, with a win on Saturday upping that total to 11. Webb City had its 91-game regular season winning streak ended on Sept. 6, 2013, in a 42-35 loss at Arkansas Class 7A state powerhouse Har-Ber. However, the Cardinals still have not lost to a Missouri school since a 38-13 setback to Kearney in the 2009 state semifinals. Webb City has not dropped a regular season game to a Missouri school in over a decade, the last loss being at Hickman midway through the 2003 season. The Cardinals won their seventh-straight Central Ozarks Conference-Large Division title this fall after rolling through league play at 7-0, with an average margin of victory of just under 35 points per game. The Cardinals’ closest conference game came in the season opener, a 21-0 defeat of rival Carthage. Webb City has yet to lose a COC game since joining the conference in 2008. Dating back to 1999, including titles from the now defunct Southwest Conference, the Cardinals have won 15-straight conference titles. So what sets Webb City apart from other schools? What is different about the Cardinals’ program? Is there any one factor that has led to such a sustained run of excellence? 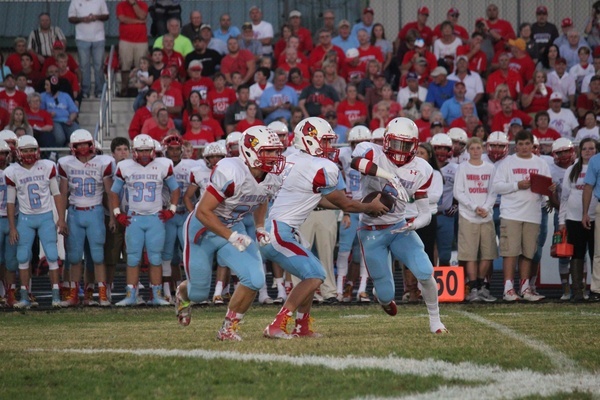 Why are the Webb City Cardinals so hard to beat year in and year out? Those are the questions that Webb City opponents have been pondering for the last 25 or so years. The truth is there is no single correct answer, and there certainly is no magic formula. However, there are a few keys to the Cardinals’ success, starting with continuity within the program. In addition, the Webb City tradition can actually be traced to perennial Division II powerhouse Pittsburg State. Finally, good old-fashioned hard work and accountability has also been a factor. The Cardinals have had just three head coaches since 1988, including current head coach John Roderique, a former 1st-Team All-State linebacker for Webb City in 1985 who has guided the Cardinals to nine state championships since taking over his alma mater in 1997. Prior to Roderique, Kurt Thompson coached the Cardinals for seven seasons, which included a pair of state titles in 1992 and 1993. The original architect of the Webb City dynasty, though, is Jerry Kill, who was hired as head coach prior to the 1988 season. Kill was lured from Pitt State, where he had been the defensive coordinator under head coach Dennis Franchione since 1985. Kill took over a program that had won more than it had lost throughout the 1980’s, yet had not won more than six games in a season since an 8-2 record in 1980. Kill said the transition from the college ranks to his first head coaching job at any level was made easier by the support he received from the Webb City administration, and especially from Superintendent Ronald Barton and Associate Superintendent Ron Lankford, who would succeed Barton as superintendent in 1998. In addition, Kill received a lot of knowledge and support from Tom Cox, who had just coached Webb City to a 6-4 record in the 1987 season in his one season at the helm. In his first season, Kill guided the Cardinals to an 11-1 record and a state quarterfinal appearance. In his second season, Kill coached Webb City to an undefeated 14-0 record, which included a 16-0 win over Sumner in the 1989 state championship game. It would be the first of the Cardinals’ 12 rings (and counting). Following that first state championship season, Kill was lured back to Pitt State to be the offensive coordinator under new head coach Chuck Broyles. It was an agonizing decision for Kill, who had a good thing going at Webb City. He went to see Lankford, who had become a close friend and confidante. Lankford told him to take the job. Kill was the offensive coordinator at Pitt State through the 1993 season, at which point he got his first college head coaching job at Saginaw Valley State. He followed that up with a head coaching stint at Emporia State, seven seasons at Southern Illinois, and three seasons at Northern Illinois before landing in the Big 10. “The reason that they’ve continued to win is that they’ve hired people within the system, that know the system,” said Kill of the Webb City dynasty. “Ron Lankford was the Superintendent there for a long time and he built such a strong foundation. It’s an unbelievable school. The facilities are unbelievable. And they did that during a very critical time. Ron was great at managing money, and while everyone else was falling off the end of the earth in education in Missouri, he was ahead of his time, too. I give Ron Lankford and the administration all the credit. That’s why they’re successful. Kurt Thompson, who played linebacker at Pitt State under Kill, was named to replace Kill as head coach. Despite being just 23-years-old when he was hired, Thompson began a seven-year stretch in which the Cardinals posted a 73-12 record and won back-to-back state championships in 1992 and 1993. Thompson left Webb City following the 1996 season for a nine-year stint at Kickapoo, and later coached at Republic. Roderique, a former Cardinal, became the head coach in 1997, and put down roots in his hometown that are still growing strong today. Roderique will complete his 18th season on Saturday, and enters the state title game with a career record of 221-19 (a .920 winning percentage), which makes him the winningest coach in Missouri high school football history by percentage. Since the 2006 season, Roderique has coached the Cardinals to a 125-3 record and six state titles (2006, 2008, 2010-13), with another ring within reach on Saturday. It all started with Kill, though. Then came Thompson and more winning. And then came Roderique and even more wins and even more state titles. “We made Webb City be respectable,” said Kill, recalling the early days of the Webb City dynasty. “When you came out of the locker room, you had the band, you had the cheerleaders, we let people come out of the stands, we had Bleacher Creatures, young kids. By the time we got out of the locker room and made our way down that long (path) to the field, I think other people looked over there and said, ‘what the heck is going on?’ So I think we made it important there, and it became fun for the kids. One common denominator with all three of the aforementioned coaches is their direct ties to the highly successful Pitt State program. In the modern game, whatever works in the college ranks almost immediately trickles down to the high school game (hence the proliferation of spread offenses on high school fields today). However, that was not the case in 1989 when Jerry Kill moved across the Kansas-Missouri border to Webb City. He brought with him what he had learned at Pitt State. Kill brought more than just the offensive and defensive schemes with him from Pitt State. He also brought the entire college approach to year-round football. Offseason drills and conditioning were virtually unheard of back then, but it gave Webb City an advantage over its opponents in the early days of the dynasty. Thompson, the former Gorilla linebacker, kept the Pitt State principles in place during his seven-year run. Roderique has adapted things over the course of his 18 years at the helm, but if you look closely, the Pitt State influence is still there. “Each of them put their own spin on it, but the basics were still there, because we all came from Pittsburg State,” said Kill. Coaches do not play under the lights on Friday nights. It is the players who make the tackles, catch the passes, and execute the game plan instituted by the coaches. Despite his success, a humble Roderique immediately deflected any praise to his players. One staple of any Webb City football team is that it will be fundamentally sound in all phases. The Cardinals are disciplined and rarely ever make mistakes. The Cardinals are like a well-oiled machine, and do what they do, over and over, and dare you to stop them. More than one coach has stated—in one way or another—that you will have to beat Webb City, because the Cardinals will not beat themselves. Webb City seemingly graduates six or seven All-State players every year, only to reload the following year with a lineup full of soon-to-be All-Staters. For example, this year’s Webb City team returned just eight starters total, yet will still end its season at the dome. Many past Cardinal standouts have only gotten an opportunity to make major contributions on Friday nights as seniors. At Webb City, though, boys grow up rooting for the Cardinals and counting down the days until they can etch their own names in Webb City lore. Roderique has also been fortunate enough to coach his two sons, John and Tyson, both of whom are quarterbacks. The younger John helped lead the Cardinals to a 45-0 record from 2010 to 2012 and three-straight state championships before moving on to play collegiately at Sam Houston State. Meanwhile, Tyson will be looking to lead Webb City to a state title on Saturday after moving into the starting quarterback spot this season. That sense of family starts with the youth of Webb City, who grow up dreaming of wearing the powder blue and cardinal red. Most schools have feeder systems for their football teams, be it middle school teams or youth programs. The future Cardinals, though, get indoctrinated into what it means to be a Webb City Cardinal at an early age, and Roderique and his staff are as involved as they can be in the process. Schools all across the Ozarks—and the state, for that matter—that have hosted Webb City have also hosted the Cardinals’ traveling support group, which usually numbers in the hundreds (and possibly thousands, depending on proximity and which round it is of the playoffs). Webb City fans usually arrive before the ticket-takers, and can be seen massing around the entry gates a couple hours before kickoff. Kill has coached at several different stops in his career, from Webb City all the way to the big city of Minneapolis. Webb City and its people still have a soft spot in his heart, though. Very few coaches in the state can say that they have beaten Webb City on the gridiron. Some have the unenviable task of trying to stop the Cardinal juggernaut on an annual basis, notably the coaches of the other seven COC-Large schools. To date, no COC school has emerged victorious in the past seven years. The Cardinals’ closest call came last season at upset-minded Nixa. The Eagles eschewed an attempt at a game-winning field goal in the waning seconds, eventually losing 24-21 in overtime. Ozark’s Mark Bliss just wrapped up his fourth season for the Tigers. He has faced Webb City four times and has come away with four losses. Bliss guided the Tigers to the Class 5 state semifinals in 2012, with Ozark’s only regular season loss a 28-7 defeat at the hands of the Cardinals, the closest margin of the four losses. Bliss knows a thing or two about winning big, winning every year, and establishing a tradition of excellence, having coached at Conway Springs, a Class 3A school located outside Wichita, Kan., before taking a coaching job in Florida and, ultimately, landing at Ozark. Before Bliss and his staff arrived at Conway Springs, the school had not won a state championship in any sport. After installing the single-wing offense, Bliss led Conway Springs to a state title in 1998. The school would win three more state titles before Bliss left, and another the year after he departed. The run included a 62-game winning streak. Another coach who faces Webb City annually, and who requested to remain anonymous, has a deep respect for the Cardinals’ program. In particular, the Cardinals’ fundamental football impressed this coach. Republic head coach Wes Beachler has made a name for himself by resurrecting downtrodden programs, having led reclamation projects at Houston, Parkview and Nevada prior to taking the head reins at Republic. Beachler, winless in two games against the Cardinals, also has respect for Webb City. Bliss believes that the culture of winning that was established long ago at Webb City is still prevalent today. In addition, as an opposing coach, the Cardinals’ love of and passion for the game of football is strongly evident. Webb City will play for another state championship on Saturday. That is the norm—the expectation—each November for the Cardinals. It is what each class of Cardinals has grown up dreaming about, of playing in the dome for a ring. Webb City is one of the winningest programs in the country. The Cardinals’ run of excellence over the past quarter century is simply remarkable. It is the program in the state which all other programs strive to become, and the program that is worthy of other team’s respect, begrudging or not. Someday Webb City will lose another game. Someday the Cardinals will even lose a conference game. Teams don’t win state championships every year. Winning streaks always end. It will take another team’s best game, but eventually it will happen…won’t it?